An earnest and well-made independent film – small in its scope, original in its perspective and more importantly, honest towards its big ambitions – is hard to come by, and when it does, the occasion calls for a celebration. Destin Cretton's second feature film Short Term 12, which became the breakout sensation of this year's SXSW Film Festival by winning the Grand Jury Prize as well as the Audience Award, is one gem of a film that deserves all the accolades awarded to it (so far), and (hopefully) further recognition for its innovative writer/director, as well as its brilliant lead actress - Brie Larson. Short Term 12 is essentially about a group of 20-somethings working at the titular facility that houses and counsels troubled teens, and ultimately about Grace (played by Brie Larson, who also won the Best Actress award at Locarno Film Festival this past weekend) and her boyfriend Mason (played by John Gallagher Jr.) who are in the heart of the operation. The immediate qualities that stand out about them (and the rest of the counselors of 'Short Term 12'), such as their eloquence, ease and accessible demeanor immediately pull you in to their world and make you want to, you know, hang out with them. Cretton is smart to start his film with small-time (yet hilarious) banter among the group and interrupt it with one of the screaming teens running out of the facility, in order to give us a perfect glimpse of what must be the recurring structure of their every day through revealing just the tip of the iceberg. While carefully building the characters' dynamics within their environment and setting Brie and Mason apart, Cretton makes sure you never forget how tempted you would be to disregard them had you been one of the kids, but how quickly you would come around and say "there is no way of not responding positively to that". What you see on screen is some good old-fashioned love and trust that a group of people early in their adulthoods strive to inject to those lives that can be turned around in time with exactly that. And we're not talking about disingenuous textbook methods here; you're looking at some of the most resourceful, humorous and assertive 20-somethings you've seen on screen in a while. Concepts such as love and trust that you'd skip as 'clichés' come easy to them. Like they did to your favorite teacher in school. Slowly but surely, we come to realize Brie and Mason are not that problem-free themselves, however. As we get to take a closer look into their relationship, the scars they have carried and covered up their entire lives surface. Especially for Brie, whose consistent bike riding (which she romanticizes during a beautiful exchange with Mason) symbolizes her need for solitude and individuality she aims to maintain… until an abused young girl, Jayden, (played by Kaitlyn Dever) checks into the facility and reminds Brie of the girl she once was, and more importantly, she might have continued to be. There's no fun in revealing exactly how the members of this unlikely bunch help one another, and complete each other like the pieces of a puzzle. You need to invest your time in it, and perhaps learn a lesson or two about the world (this is not an empty promise, I swear), and who knows, about yourself, too. 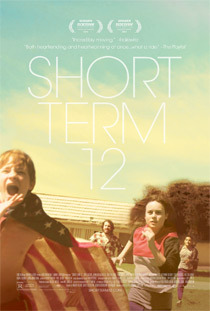 Just know this: there are many stories told and lived on screen in Short Term 12 (my favorite one being about a little octopus) in this ingenious little film that will help you to do so. The stories come in the form of a song, an illustration, a solemn dialogue between two people or just casual banter among coworkers during a break. And it's worth mentioning that two of the told ones (impeccably written just like the rest of the film) tightly bookend all that is lived, making this movie one of those perfect storytelling artifacts that manage to evolve all of its characters while somehow beautifully coming full circle. Believe me when I tell you that you've never seen anything like this (even if in the beginning, it may seem like you have already seen this). And also believe me when I tell you that once the curtain closes on 2013 and we find ourselves scratching our heads over the noise of never-ending "best of" lists, you'll feel like making one of your own just to award Short Term 12 one of the top spots. It will inspire and illuminate you and you'll want the world to know. Yes, it's that good. Damn I had a chance to see this film and I missed it and now I keep hearing about how good it is and I'm kicking myself.. Thanks for the review!